Cuddly Critters for little Geniuses written by Susan and James Patterson and illustrated by Hsinping Pan is a collection of creatures from around the world, not often discussed, that will delight the curiosity of young children. The creatures are organized into three categories: Flyers such as the Sugar Glider, Royal Flycatcher and the Potoo, Swimmers such as the Parrotfish, the Puffer Fish and the Blobfish and Crawlers such as the Blue Poison Dart Frog and the Tonkin Monkey. Many of the animals featured in this book can do fantastic things. The Potoo, for instance, looking very much like a piece of wood, can hide right in front of your eyes as it sits quietly on the branch of a tree. The Sugar Glider can float long distances through the air without ever touching the ground due to the webbing between its arms and legs. The Pangolin, a mammal with a coat of scales, has an appetite for twenty thousand ants per day! The illustrations are energetic, colorful and fun. The Royal Flycatcher has a plume of feathers sprouting from the top of its head! The Scarlet Macaw flies across the page all blue, gold and orange. The double spread illustration of the Snowy Owl is beautiful and commanding. Under the book jacket the book cover itself reveals a joyful gathering of all the book’s critters. And the texture and weight of the paper inside is perfect for little hands that will want to turn the pages over and over again. 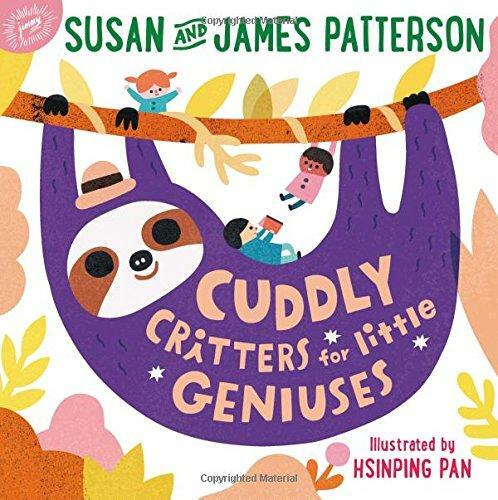 Cuddly Critters for Little Geniuses written by Susan and James Patterson and illustrated by Hsinping Pan is beautifully developed and designed for ages 3-6 (JIMMY Patterson Books/Little Brown and Company, 2018). There are nearly fifty critters shown in this book. Look them over again. Do you have a favorite? Can you give your favorite critter a name? Which critter do you think is the largest? Which one is the smallest? Which one makes you laugh? Why? Which one would you want as a pet? Why? Where would you keep it? Draw a picture of you and your critter pet. Let your imagination help you. Move like some of the critters in the crawler section of this book. First get on all fours and pretend to dig through the ground with your front claws like the Pink Fairy Armadillo. Can you feel the dirt? Next, roll around on the ground and take a mud bath like the Bongo antelope. Can you smell the mud? Finally, run fast in zigzags like the Jerboa. Can you feel the wind on your body? Make sure you have plenty of room to move safely. Have fun! Can you make the sound of a Toucan? The sound is described in this book as being a cross between a pig sound and a sound of a frog. Go ahead and try it. Ask your family members to join you to make a chorus of Toucans!